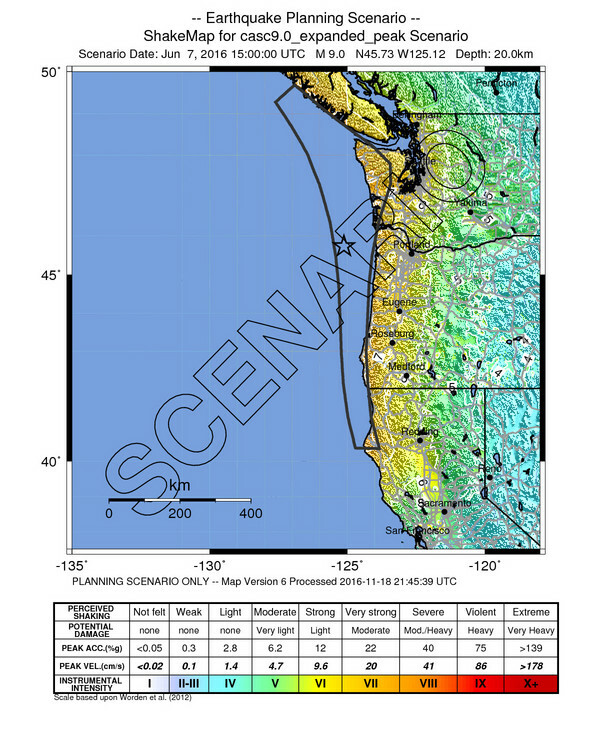 Here is a map of the Cascadia subduction zone, modified from Nelson et al. (2006). 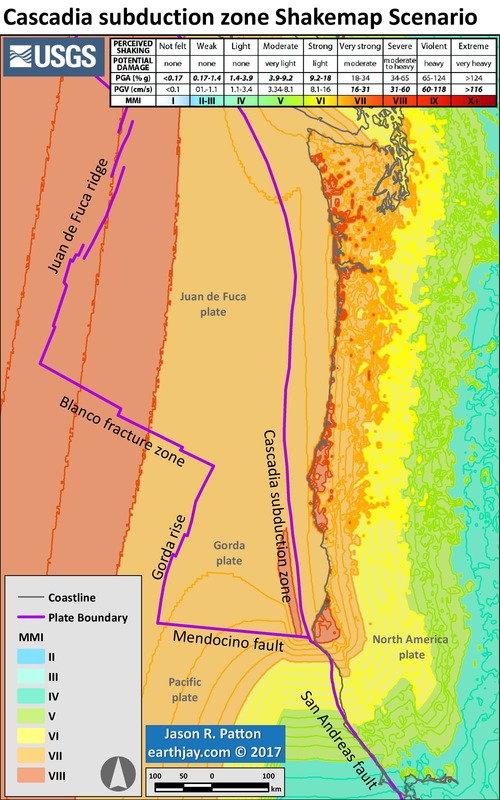 The Juan de Fuca and Gorda plates subduct northeastwardly beneath the North America plate at rates ranging from 29- to 45-mm/yr. Sites where evidence of past earthquakes (paleoseismology) are denoted by white dots. 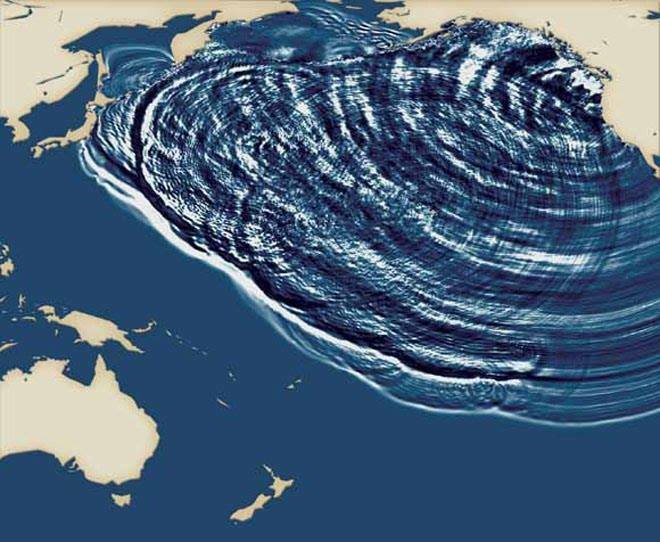 Where there is also evidence for past CSZ tsunami, there are black dots. 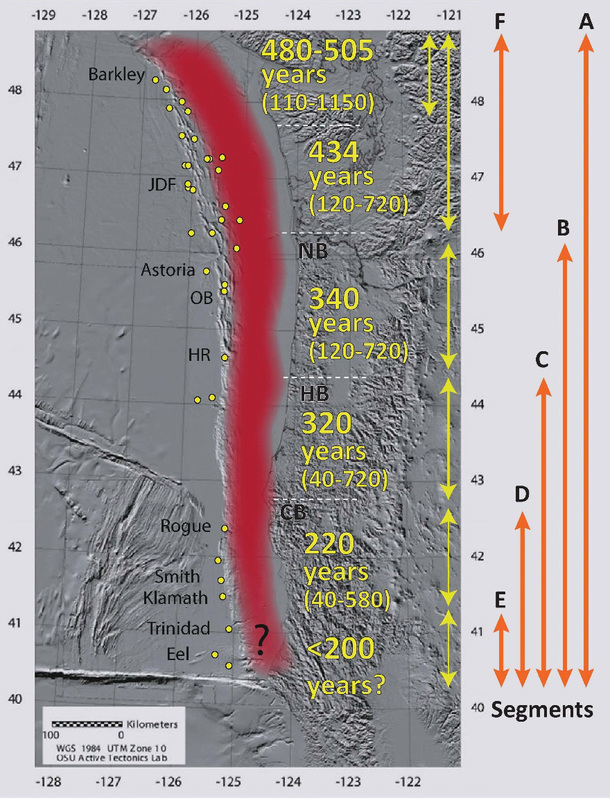 These paleoseismology sites are labeled (e.g. Humboldt Bay). 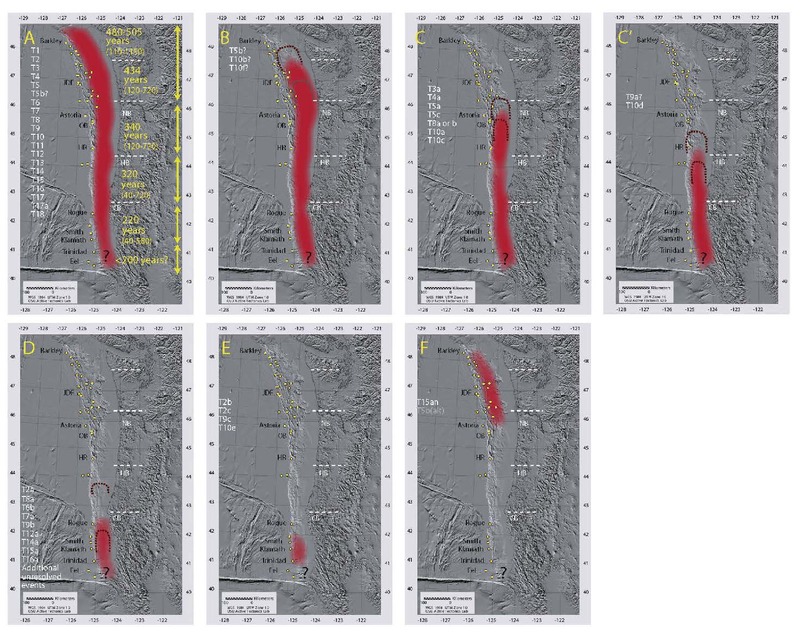 Some submarine paleoseismology core sites are also shown as grey dots. 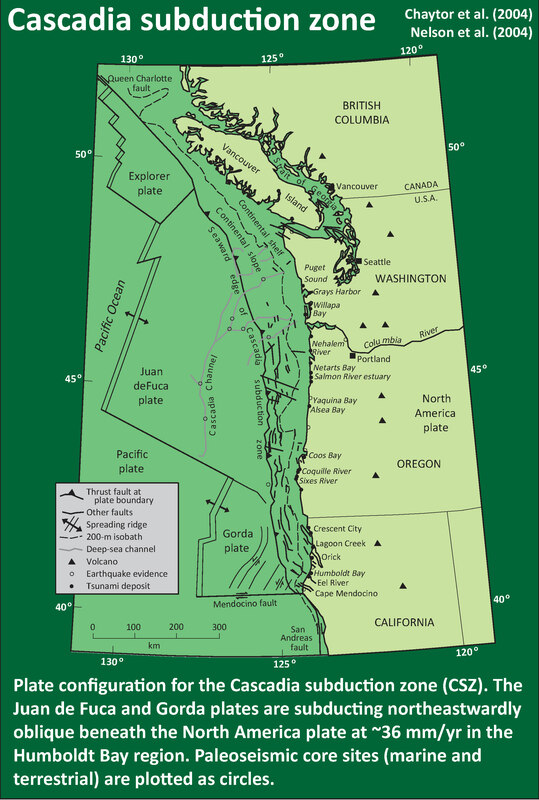 The two main spreading ridges are not labeled, but the northern one is the Juan de Fuca ridge (where oceanic crust is formed for the Juan de Fuca plate) and the southern one is the Gorda rise (where the oceanic crust is formed for the Gorda plate). What do you think the max run-up heights could be from and event in our region? really depends upon the location…. based upon what i saw from the current modeling (to be released soon I hope), it looks like maybe 5 meters on the open coast +-. but it is strongly dependent on location… and when I was looking at the maps, I was focused on the northern North Spit. this is what i have been talking about for years, but the tsunami models are finally showing the lower runups i expected. but we cannot predict any of this, just forecast with some level of certainty. ;-) tho if one stays out of the yellow regions on the RCTWG tsunami evac maps, they will be safe from tsunami (but NOT from ground shaking). 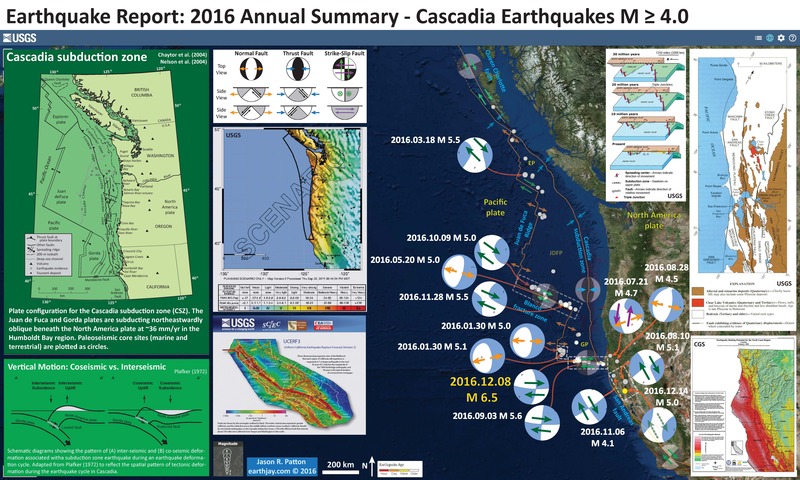 note in my map above (higher res on my report) the high ground shaking in our region!!! very high in humboldt. 317 … can’t even divide a 10 into it?….or 115,705 day anniversary? Be careful to not oversaturate on a single event that is not too likely to happen soon, otherwise it may have the opposite effect. 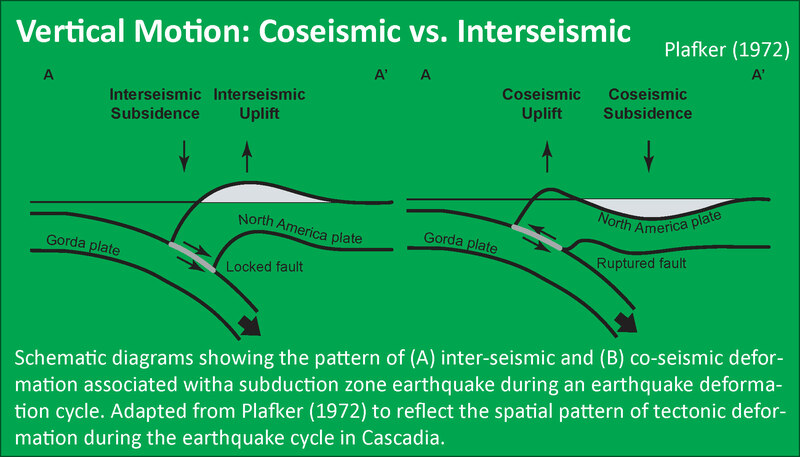 A southern San Andreas rupture on the statistical likelihood scale is MUCH more likely to happen and yet all I hear about is Cascadia since “the” article. A tough balance, but maybe we are driving that one hazard too hard at the expense of more likely scenarios — and I haven’t mentioned drowning in a flood or being burnt up in a wildfire. All important but I think we’ve maybe gone of the skids :>) Maybe celebrate every 5th year—ha! I feel a responsibility to my general education classes to produce a summary of this, with something new added (used arcgis to plot MMI scenario this year). I understand. But since this hazard is at my feet, I remember it every day. So you are welcome I don’t post about it that frequently. Heheheh. To give you credit where it is deserved (and for my under represented students that likely have families that live closer to these higher probability faults, I included s shake map scenario for some other faiths in my digital presentations today. Almost as if I anticipated (predicted? Heheh. NOT) your comment. Love you bro.